The Growing Enterprise Matchfund is to encourage enterprising food production in London, particularly among those who are new to selling produce or are trying out new activities to generate income. This scheme is supported by the Mayor of London. This autumn we're offering up to £50 in match funding for enterprising actvities in gardens during The Urban Harvest on Saturday 22 September. Gardens must be registered to join The Urban Harvest and can then apply to receive match funds. From fresh fruit and vegetables, salad bag and herb bundles, to garden preserves and prepared foods with harvested produce - The Urban Harvest is a great opportunity to raise some funds for your garden! Read more about the Urban Harvest Match Fund and sign up to join The Urban Harvest and apply for funding. 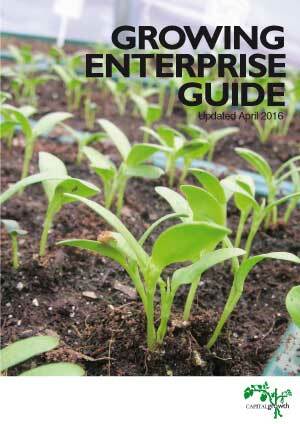 The publications below are excellent resources for growers, both within and beyond London. Each are available to download and we hope you find them useful. Capital Growth is London's Food Growing Network, with over 2000 members. Whether you are growing at home, as part of an allotment, in a community group or school you can join for free to receive benefits such as discounts, advice and monthly enewsletters. Capital Growth is a project of Sustain: the alliance for better food and farming.